A hipster hangout with shops dressed up in shocks of pink and bright yellow, a couple of good eateries, and two fantastic beaches within walking distance make laid-back Pa’ia a great place to call home while on Maui. 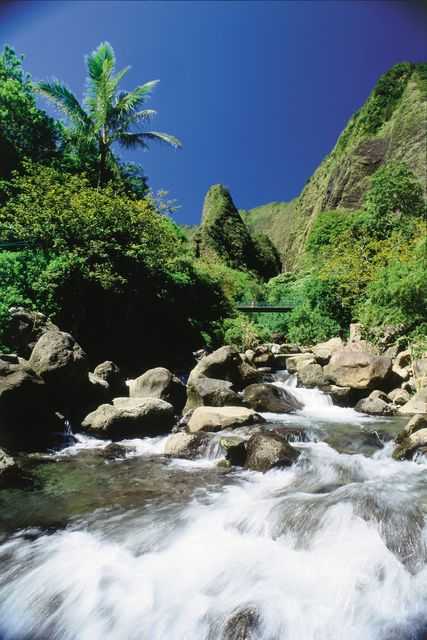 Strategically located in central Maui, Pa’ia is a springboard to up-country explorations—day trips to Kihei and Makena; Wailuku, home to the sacred Iao Valley—and is gateway to the splendid drive on the coast-hugging Hana Highway. My first stop in Pa’ia was Mana Foods featuring plentiful organic fruits and vegetables from local farms, and a deli counter with hot prepared dishes. I stocked up on breakfast treats, fruits, and local coffee to ensure a leisurely rise at the Bicycle Inn and to reduce the number of costly meals out. Kuau Store, just steps away from the Inn, carries selections of my favorite local food: poke—spicy chunks of raw tuna, fresh garden salads, and sandwiches perfect for a picnic. I woke to the patter of a tropical shower, so headed up-country on scenic Hwy 398 to tiny Makawao where the rain subsided. There I visited Maui Hands, an art gallery displaying exquisite work of local artists, and several shops with tropical beach wear at bargain prices. After taking in a generous fish filet taco at Polli’s Mexican Restaurant, I headed for the highlands along Hwy 377 that sport lush, green pastures spiked with yellow gorse and misty views reminiscent of Ireland. I made a happy stop at the Kula Lodge with its luscious garden overlooking West Maui. With little round cupolas for seating jutting into the view, it’s perfect for that special lunch to share with a friend. 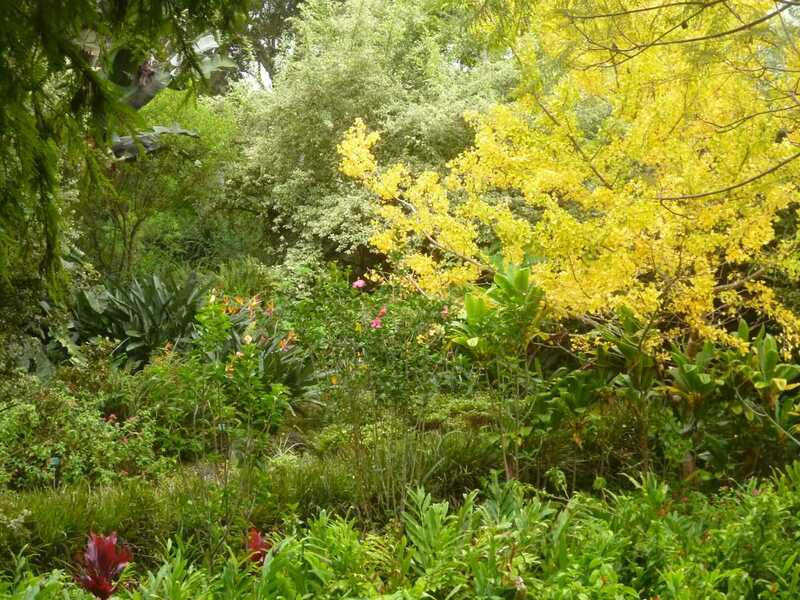 A bit further up the old Haleakala Road (Hwy 377) is Kulu Botanical Garden. 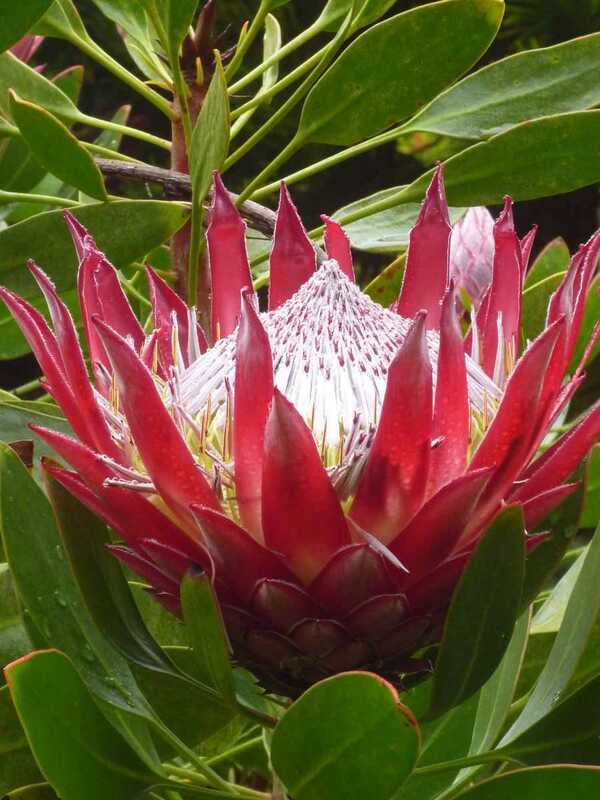 It is not huge, but it is chock full of delightful displays of tropical foliage lining manicured paths. Mist-loving plants on the flank of Haleakala Crater bloom in abundance, including giant protea, poinsettia, hibiscus, bromeliads, and more. Makena Beach is a mile-long crescent of deep sand licked by turquoise curls of foamy white waves. It is one of the most beautiful (and swimmable) beaches in the Islands. About a forty-minute drive from Pa’ia, it is well worth the effort. I felt the stress of the journey melt away as I dallied in the delicious, healing waters. Kihei, off the Piilani Hwy on the way to Makena, is laced with welcoming green beach parks shaded by banyan trees with surf tame enough for toddlers. There are a host of casual eateries lining the shoreline drive. Kona Winds blew me off of blustery Pa’ia Bay forcing me to venture to the sheltered Ioa valley, once home to Kahekili, the arch rival of Kamehameha the Great. When I arrived, the iconic Iao needle, often obscured by thick clouds, flashed a brilliant green spotlighted by afternoon sun. The sheer 3,000-foot pali that protects the valley is sheathed in thick blue-green verdure and is impossible to climb. Water whispers sweetly through taro ponds edged with rust-red ti leaves creating an Eden-like setting for a Hawaiian village. Four streams merge here to form the Wailuku River that was clogged with bodies and ran red when Kamehameha’s warriors finally did conquer the Maui forces in 1790 after many failed attempts. The road to Hana is a heart-catching experience that should not be missed. It is detailed in my piece “Doing the Hana Highway My Way” You may be frustrated by rubber necking tourists, but if you slow down and take your time to explore the many sites along the way to Hana, you won’t be disappointed. 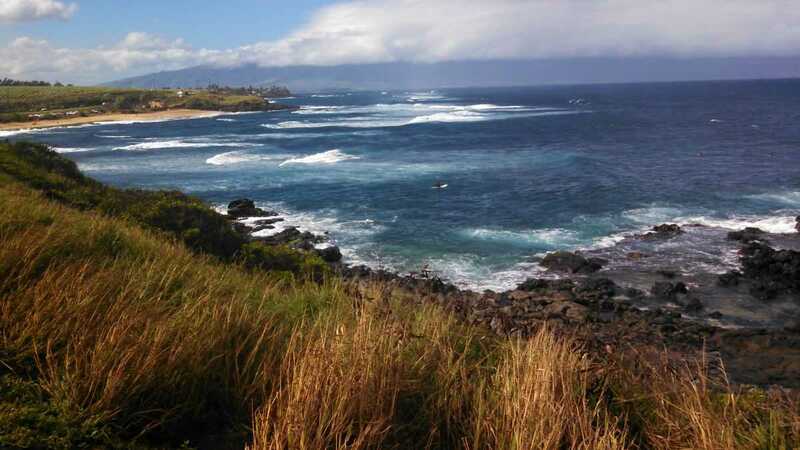 Be sure to stop at Ho’okipa Lookout, just before the 9 mile marker on the Hana Hwy, to watch world-class surfers ride enormous swells. Expert windsurfers come here to streak across the waves in a colorful display of daring and skill. 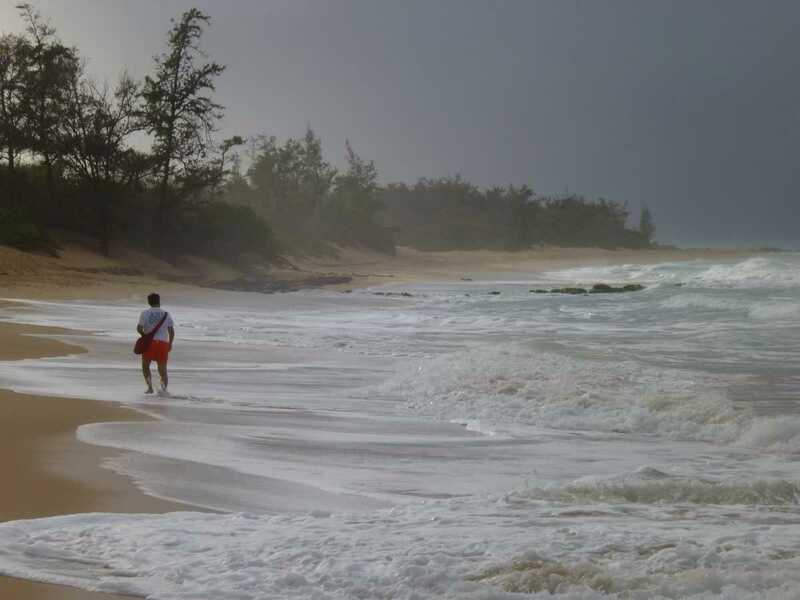 I ended each day in Pa’ia at Baldwin Beach, a favorite of local families. At both ends of the mile-long crescent there are “baby beaches” safe for swimming beside the energetic surf. Every Friday night local conga drummers congregate at sunset and add a jungle beat as you gaze upon vivid skies. My favorite evening was spent at open air Café Des Amis in Paia, sweetened by a sultry songstress serenading us with South American tunes. The spicy seafood stew made from local catch was divine and within reach of this budget-minded solo traveler.